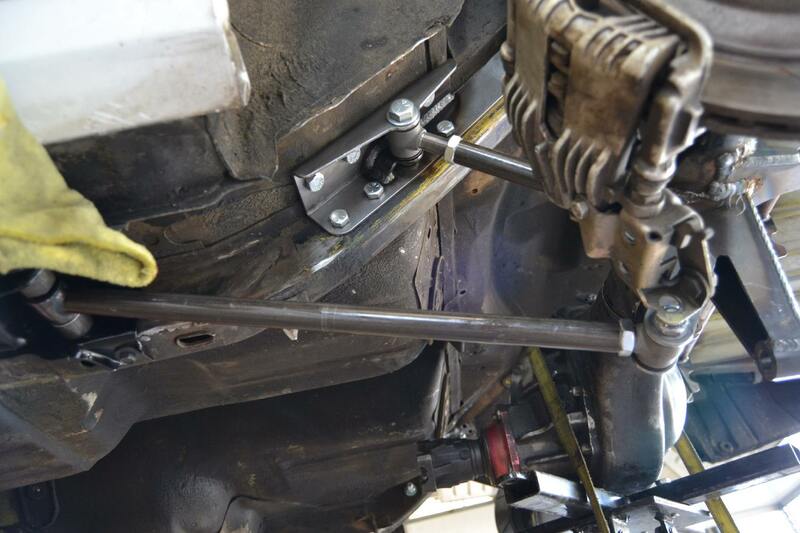 z282nv wrote: Are there any bushings used on the bolts that go through the frame rails? There are, we'll show them soon. 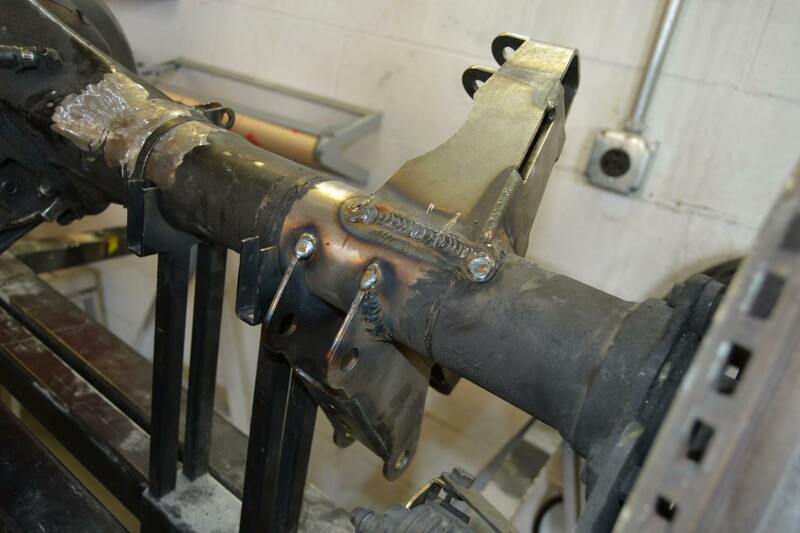 Over in the metal shop, we attacked the old 4-link mounts on the Currie 9-inch rear end. One of the first things we noticed is the seal on the center section… if you’ve used this much silicone sealer, you’ve used too much. 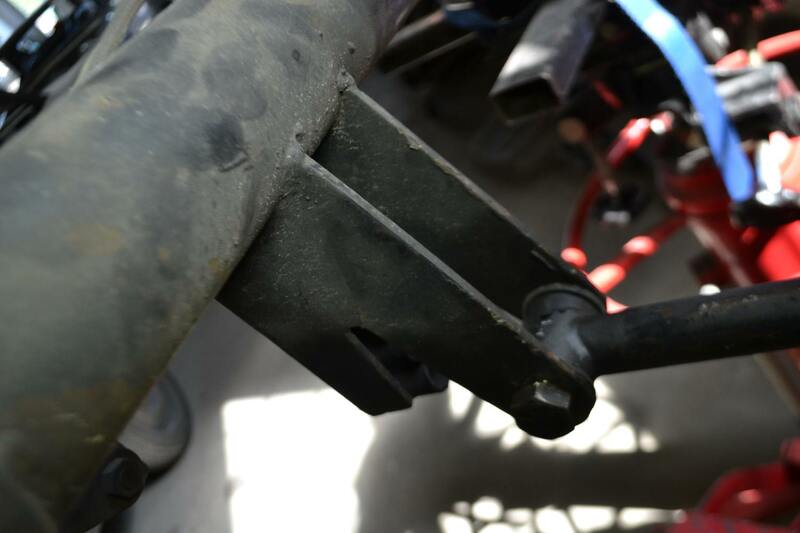 The existing mounts needed to come off so we could install the new brackets from Heidt’s, A stock 1969 Camaro uses leaf springs, so these brackets would not be present. 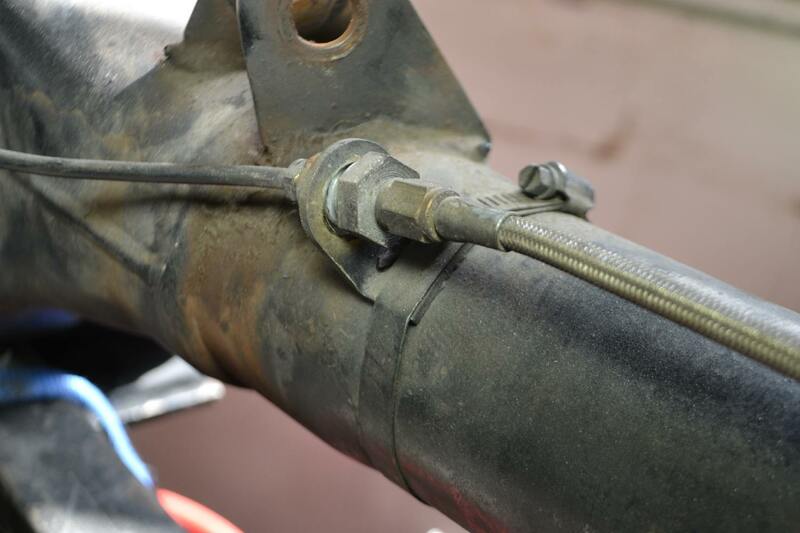 Note that the brake line is held in place with hose clamps, which is a common way to run them with add-on disc brakes. 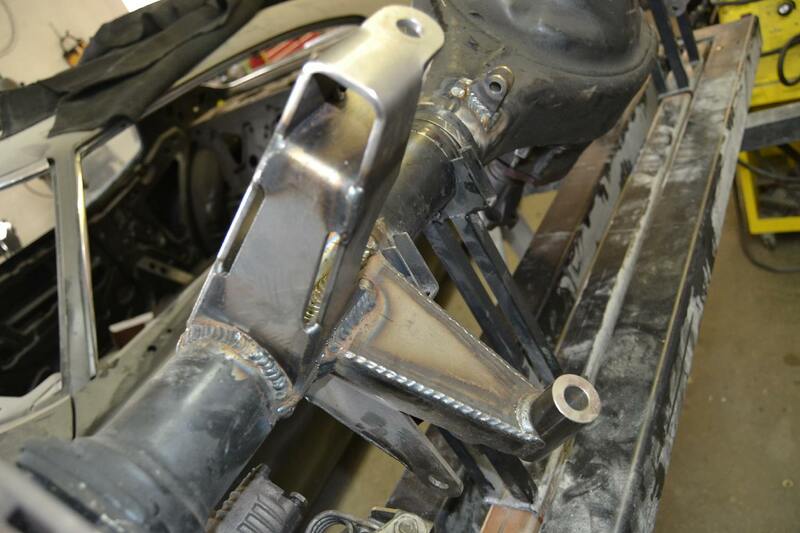 However, we’ll weld the tabs on with the new brake lines. 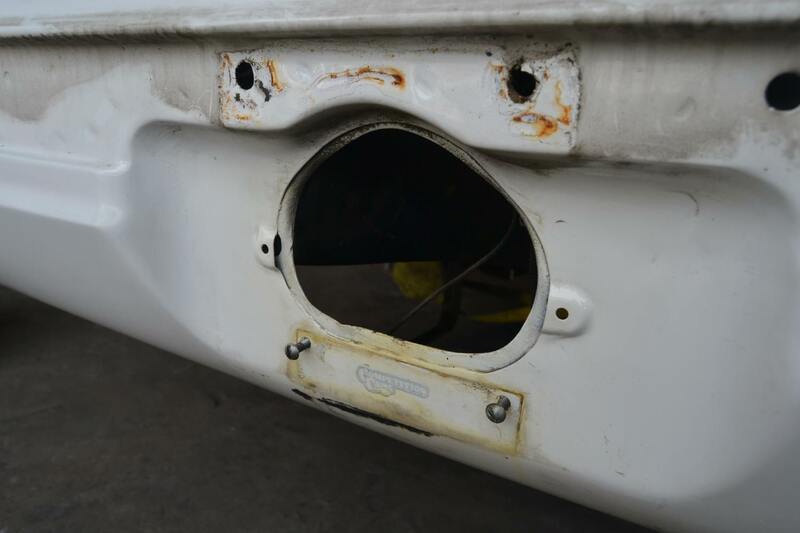 The lower brackets need to go also. And the rest is ground smooth with an air grinder and 3M Rolloc discs. 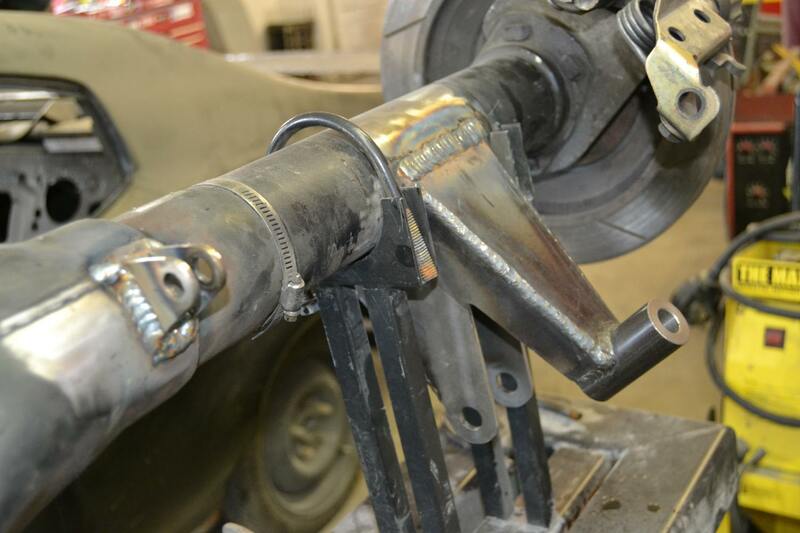 Heidt’s rear sway bar tabs welded in place with the HTP MIG 200 welder. 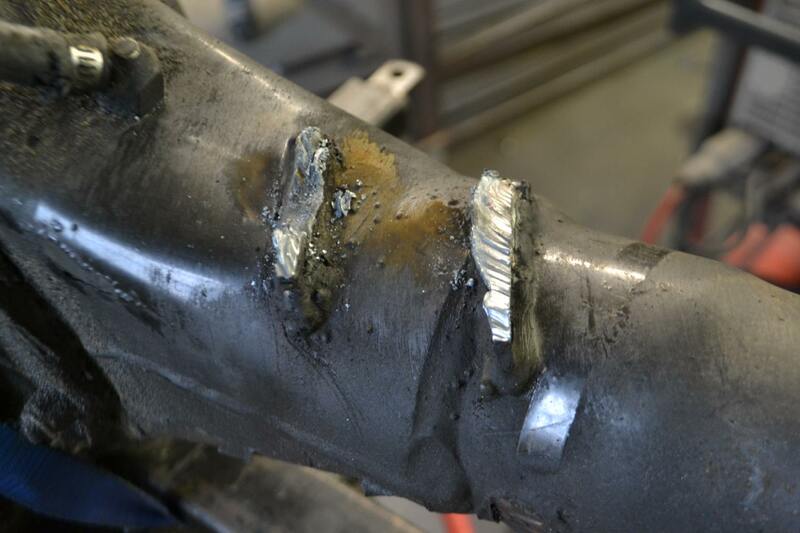 We chose to MIG these in place to match the MIG welding on the rest of the housing, as well as to expedite the process. Last Edit: 07 Oct 2015 20:51 by oestek. 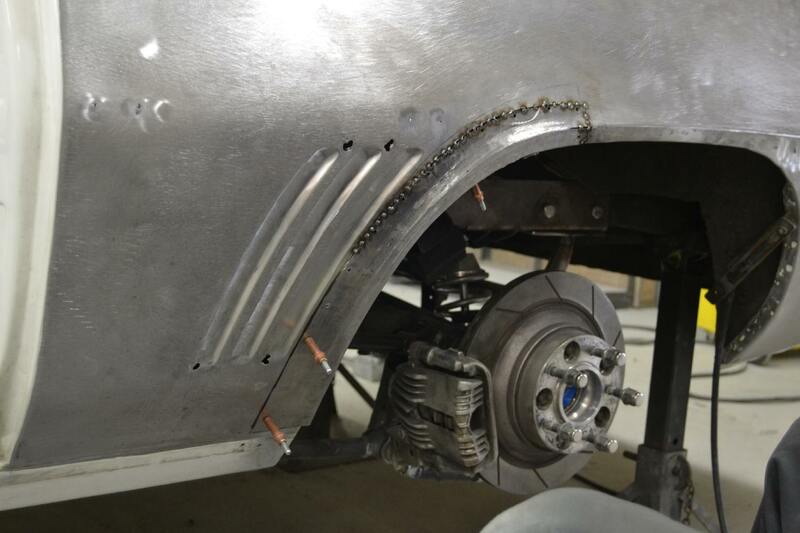 The rear was then raised up under the car and the control arms attached. 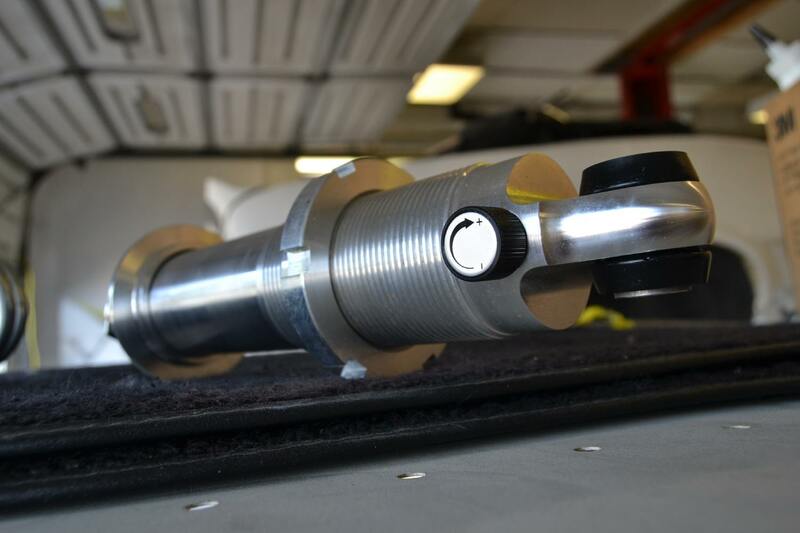 There are bushings that center the arms in the pockets, and the arms have adjustable ends to achieve the proper pinion angle. 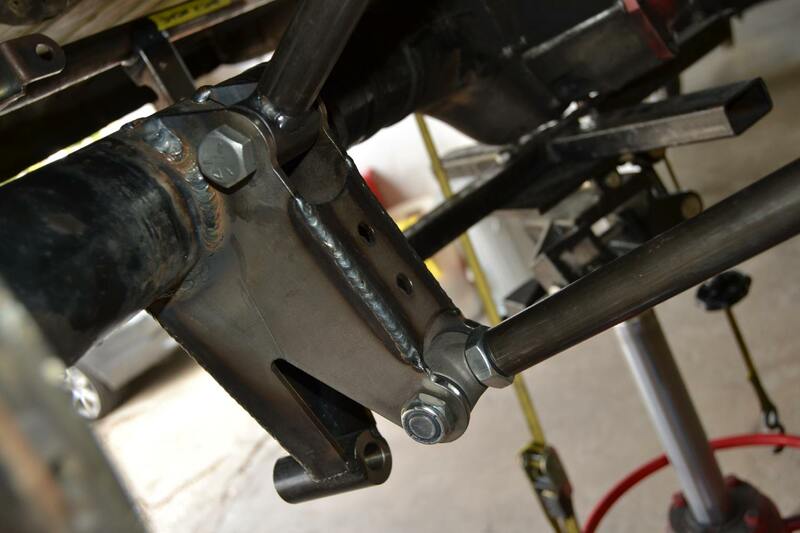 The front lower control arm mount uses the original leaf spring pocket to keep it secure. 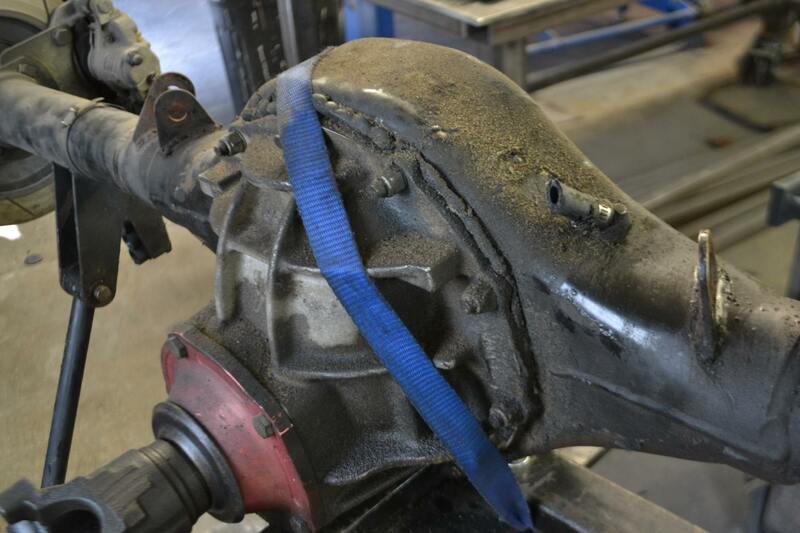 We’ll be running shorter bolts on these parts for final assembly as well. 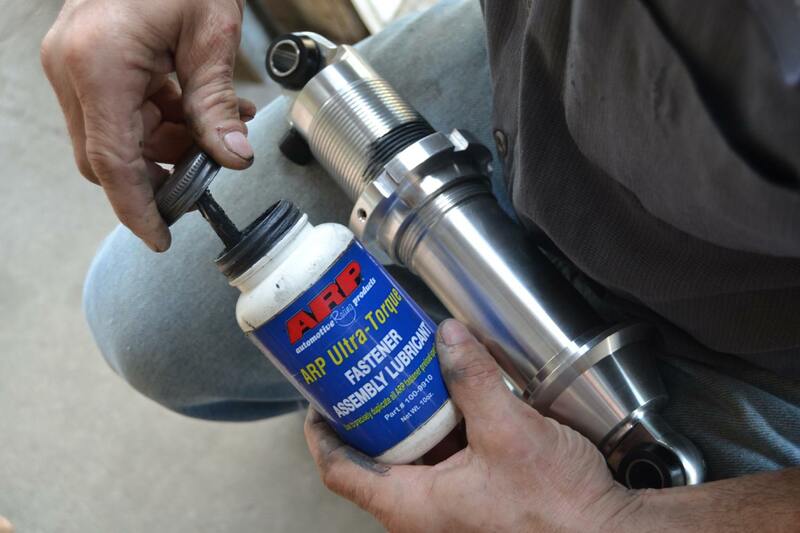 Next, we applied some ARP Ultra-Torque lube on the threads of the aluminum coil-over shock absorbers to install the spring retaining collar without galling the threads. 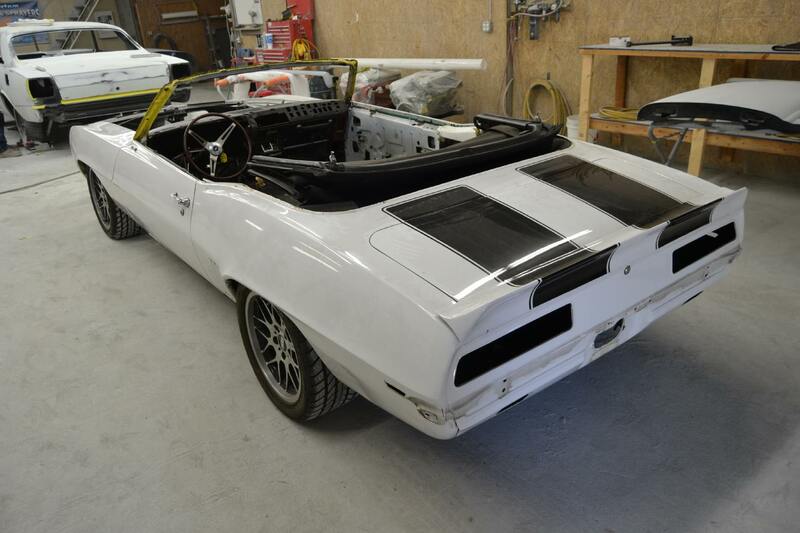 Heidt’s chose a 300-pound spring rate for this Camaro application. 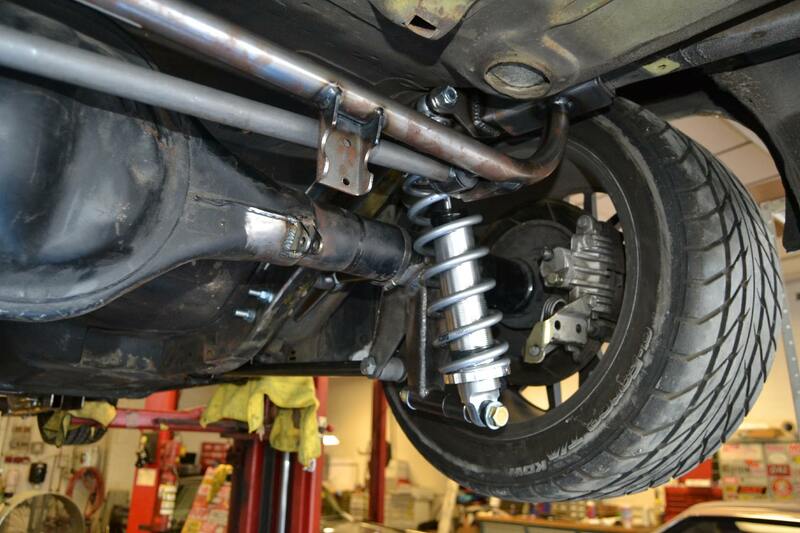 The shocks are adjustable units. 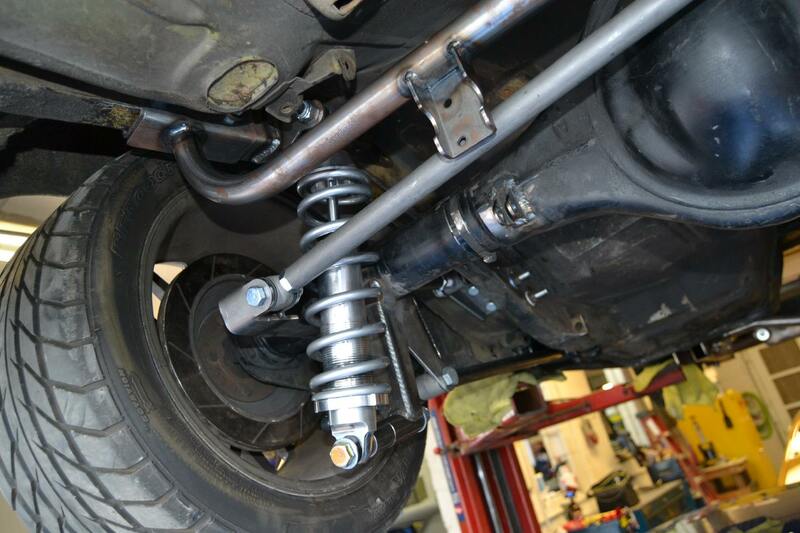 The shocks and panhard bar installed. 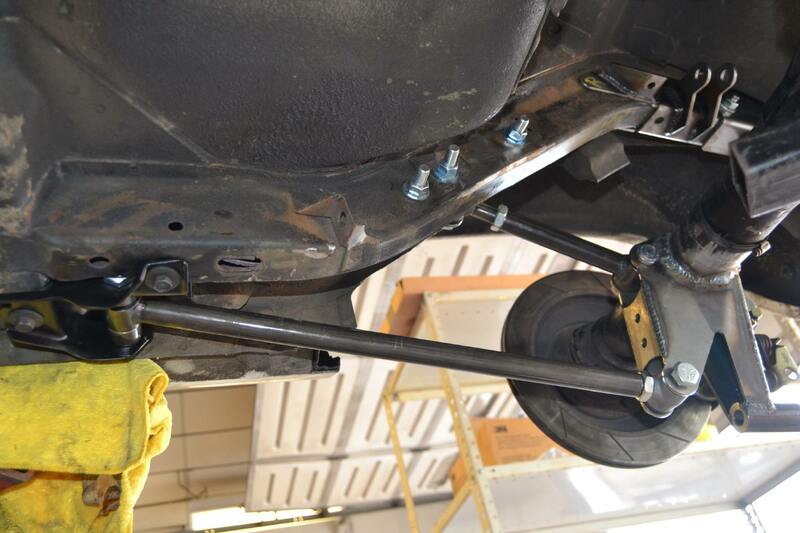 The angle looks a little funky because the rear suspension is at full-droop, even though the coil-overs limit total travel. 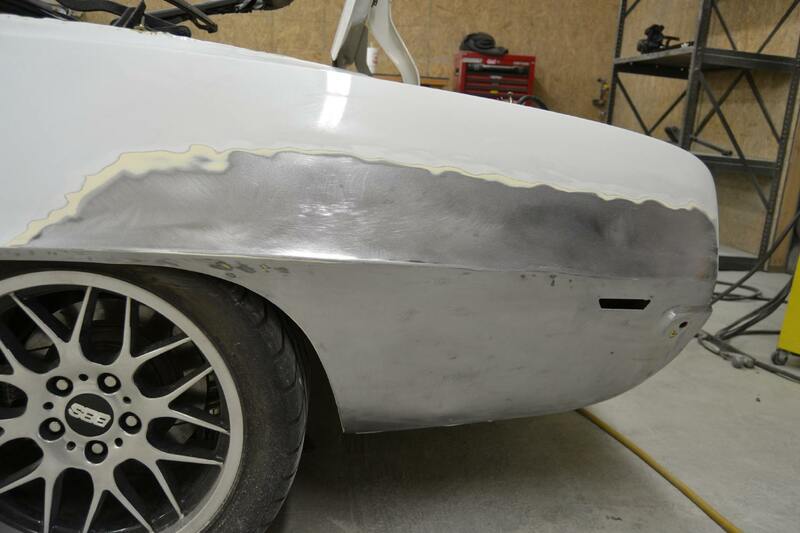 We protected all the bare metal with some Rad Rides by Troy Metal Protectant. 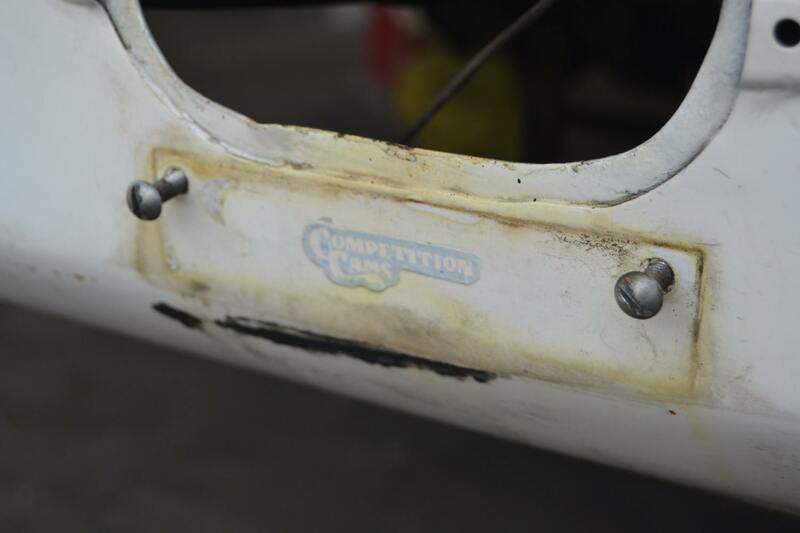 This stuff will keep the parts from rusting, and it is body-shop friendly… not an oil that will come back to haunt us! 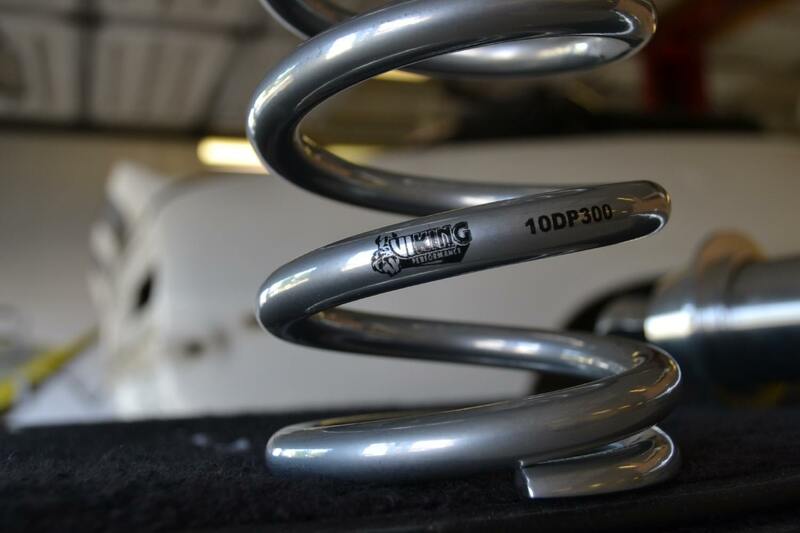 The suspension will all be “prettied up” later in the build. 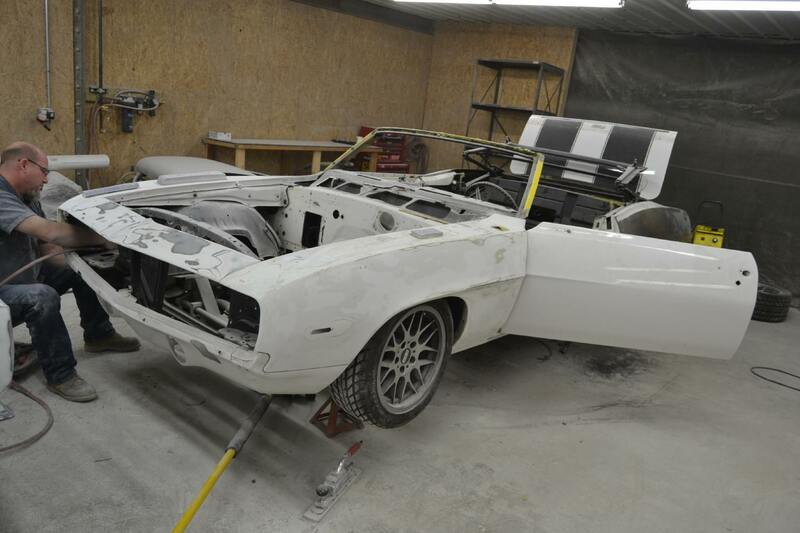 The car will now be back on it’s wheels and will be moved into the body shop for bodywork. It’s a little out-of-order for us, but we’re on deadline and have a plan. 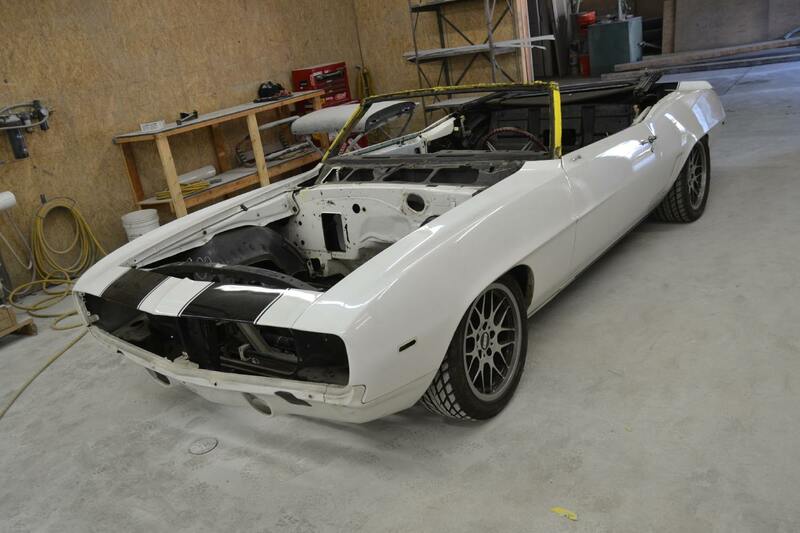 Here in the V8 bodyshop, the Camaro will be further stripped of bolt-ons, and we’ll test out the paint to see what’s beneath. 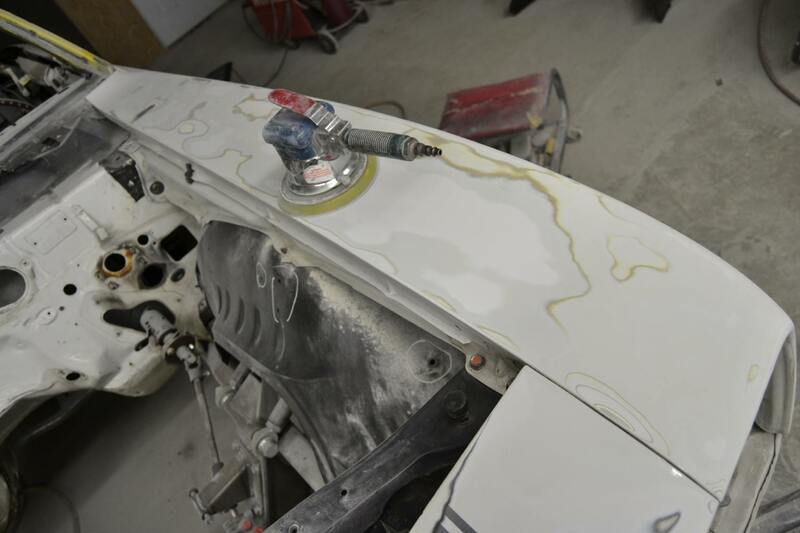 We started in the back buzzing down the paint and filler from the previous paint job with a DA sander. The good thing is that the car isn’t very rusty. 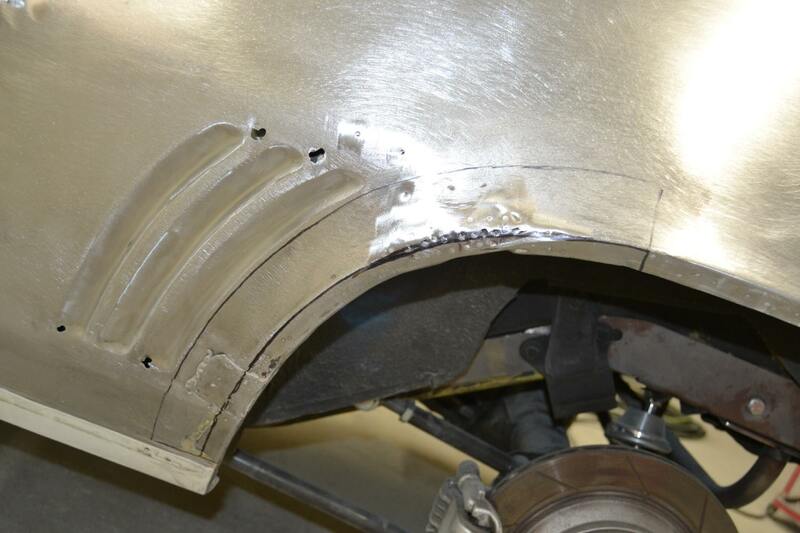 However, we found some dents in the lower part of the quarters, and on the body line. 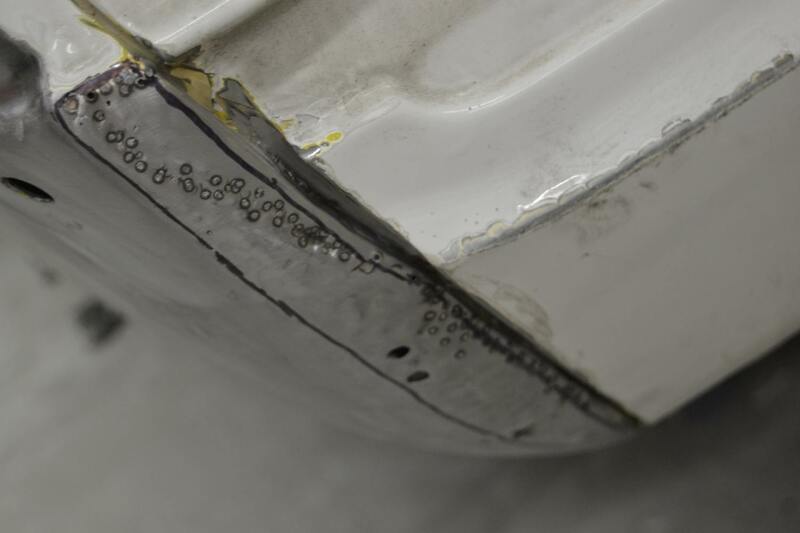 We weren’t very concerned about them, but we did note that the steel is a little thin from being ground by previous bodywork. Exposing a little more of the quarter revealed a previous patch panel just in front of the wheel. 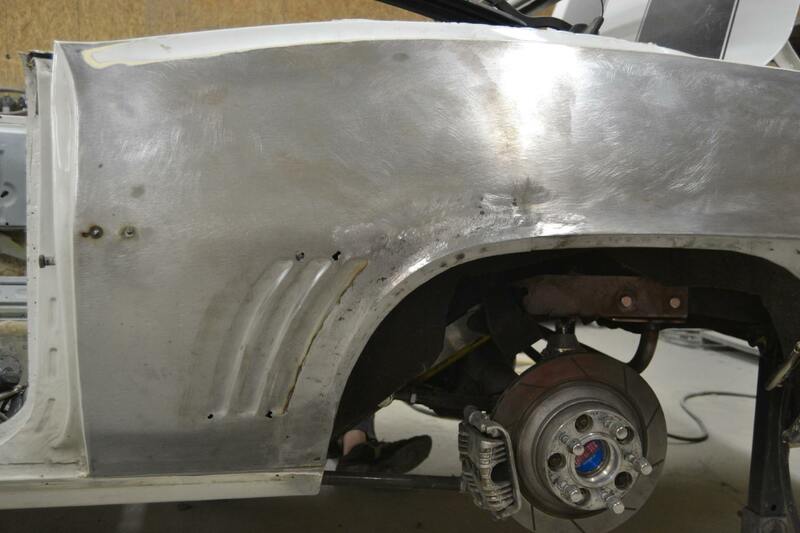 The outline is the shape of a panel Adam planned to repair the rust and existing patch. 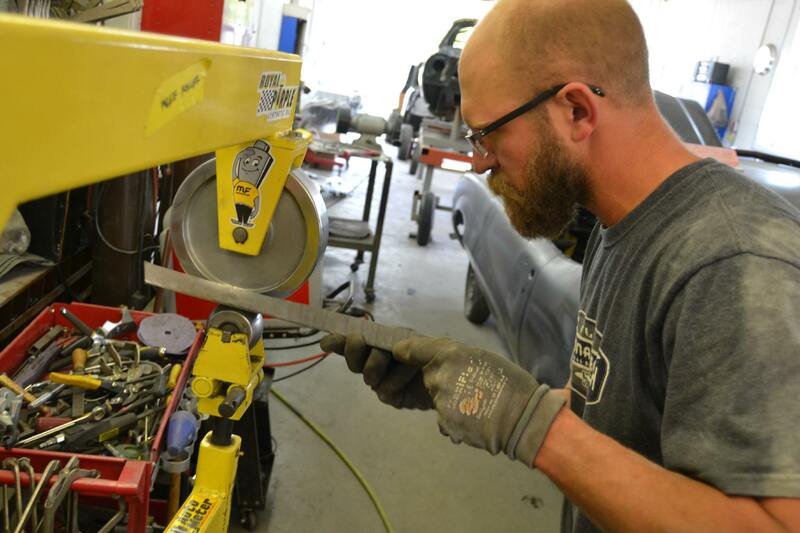 Adam used some body hammers, the English wheel, and other techniques to fabricate a repair panel. 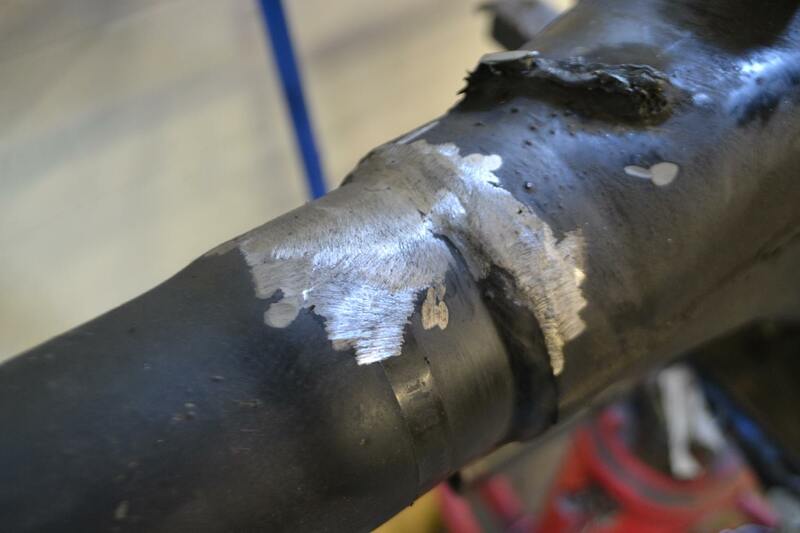 The new panel is held in place with Cleco clamps, and then a series of tack welds was used to weld it into place. 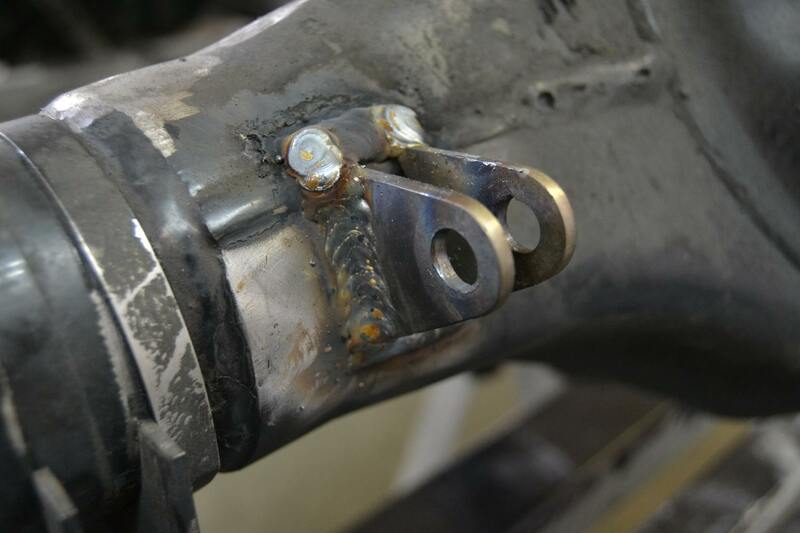 The tack welds prevent heat buildup and warpage. 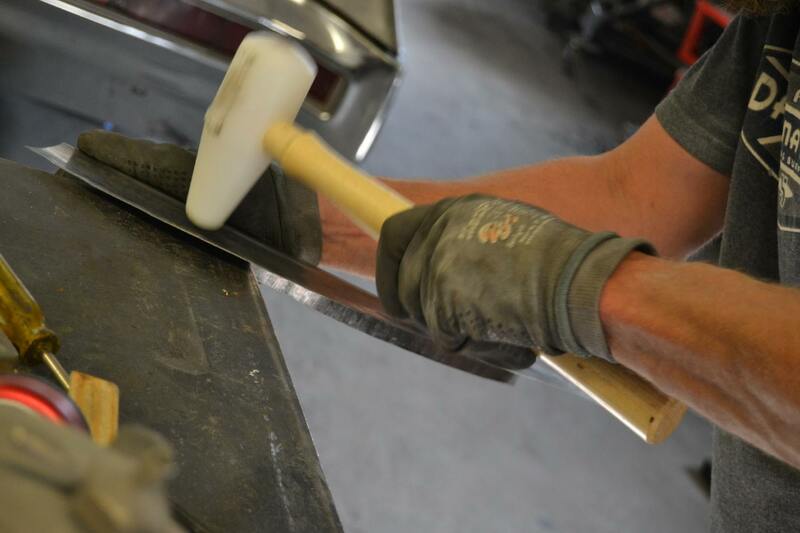 After the welding, some careful grinding blends the new panel into the old making a seamless repair. 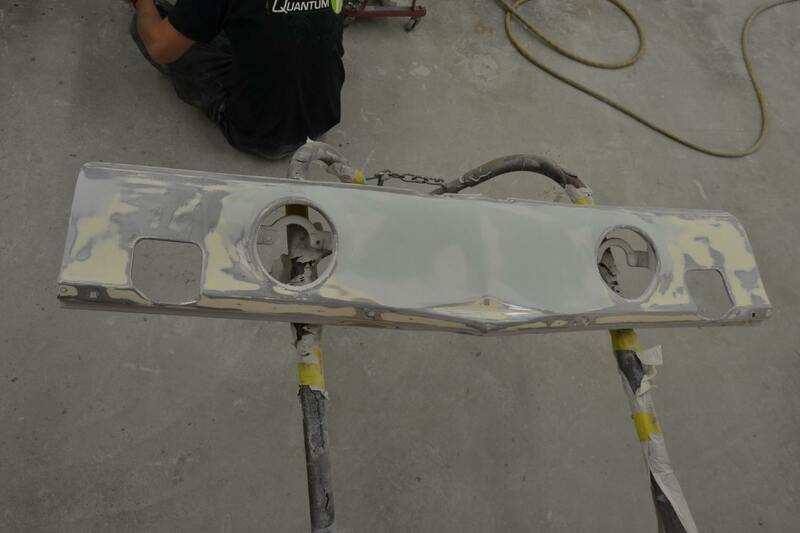 Meanwhile, the body shop crew began sanding the paint with a dual action sander. 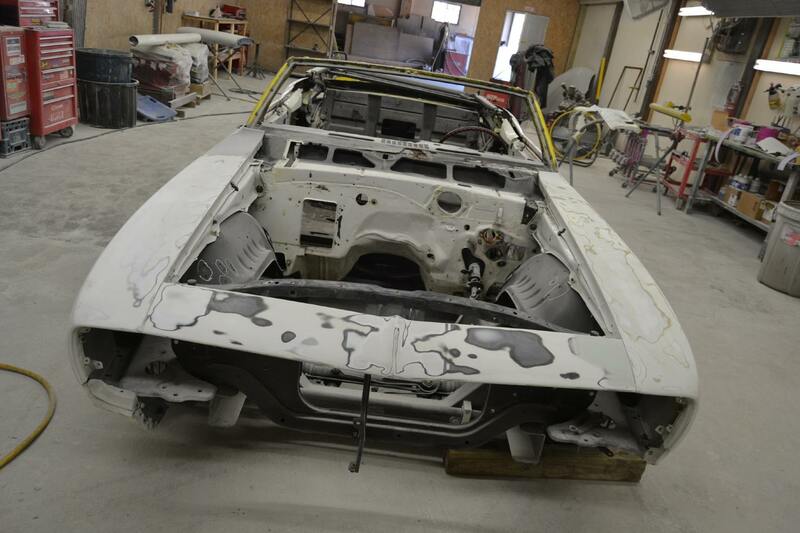 We know this car is pretty solid, so it does not require stripping to bare steel. 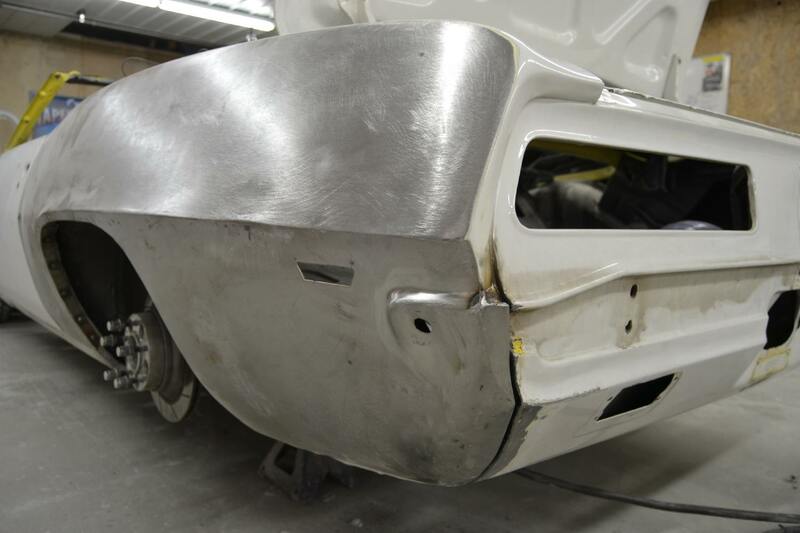 The lower valance panel was removed, stripped, and body worked as needed. 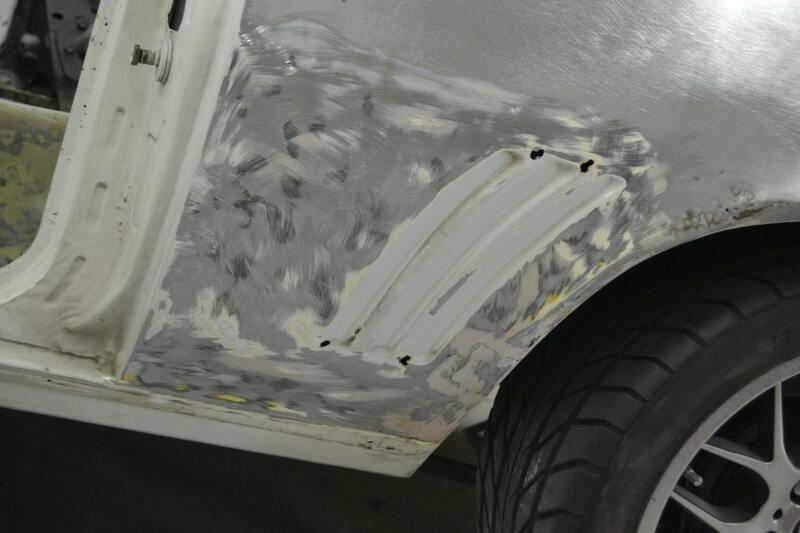 Any problem areas are repaired (like the quarter panels), but the front sheet metal seems very clean. 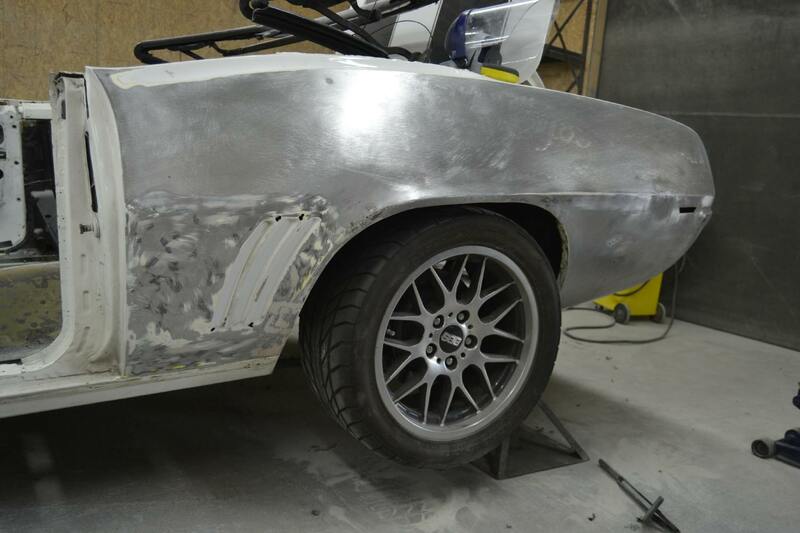 The plan is to leave the sheet-metal installed, get the panels aligned and straight, and prime the outside of the car. 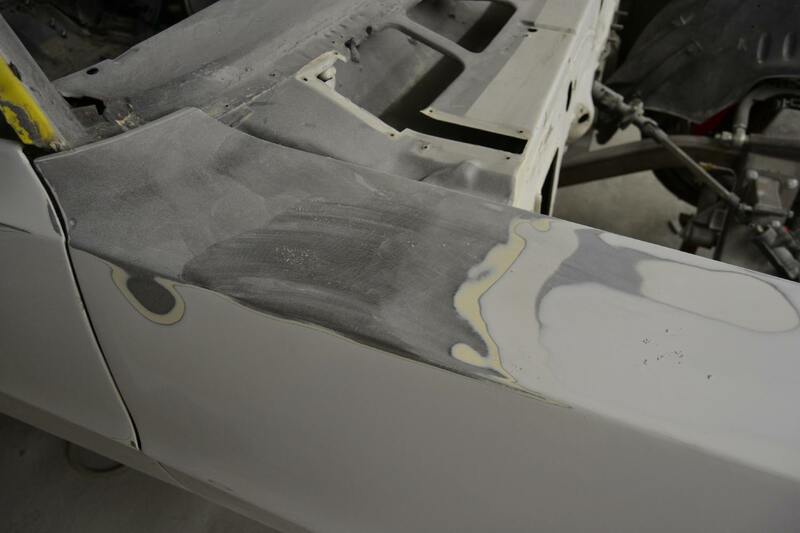 Then the car will be block sanded. 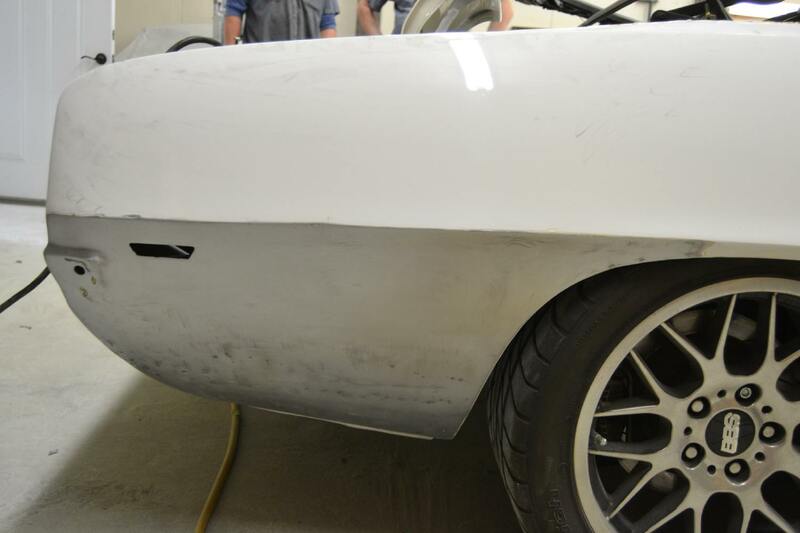 The body panels will then be removed, and the jambs and backsides of panels addressed This way, we will only be removing the panels and reassembling the car once because this job is very time sensitive. 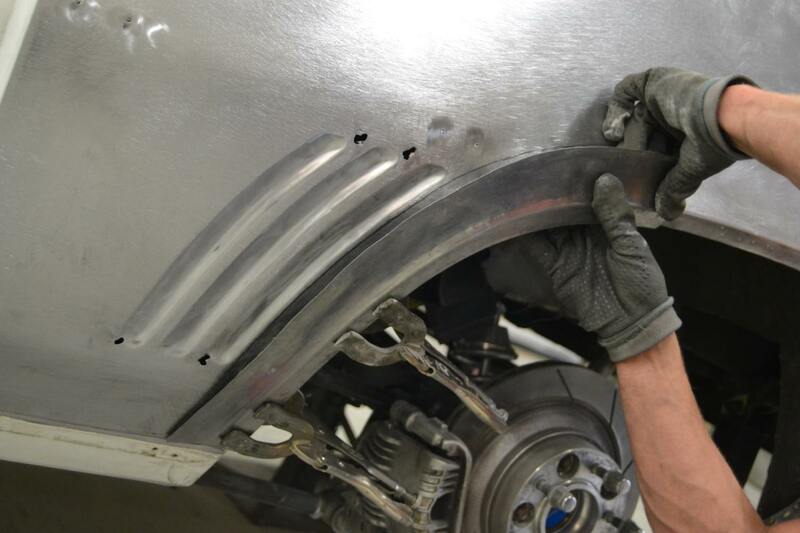 The rear of the driver side quarter panel also needed some help. It had been pushed-in and pulled for repair, but the end of the quarter where it meets the tail panel had been badly distorted and torn. We pulled on it with a stud gun for a few minutes, but determined the metal to be “overworked” and elected to make a repair piece instead. A new piece was cut, formed, and trimmed to size. 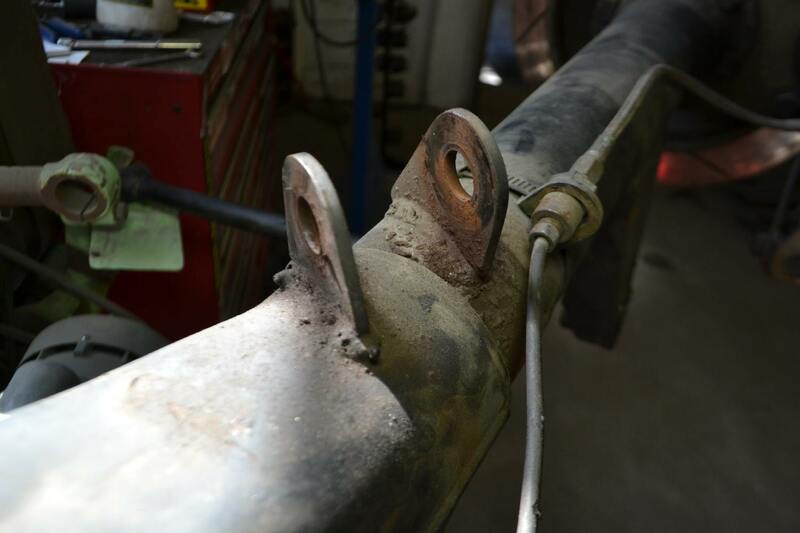 Then Adam tack-welded it in place. 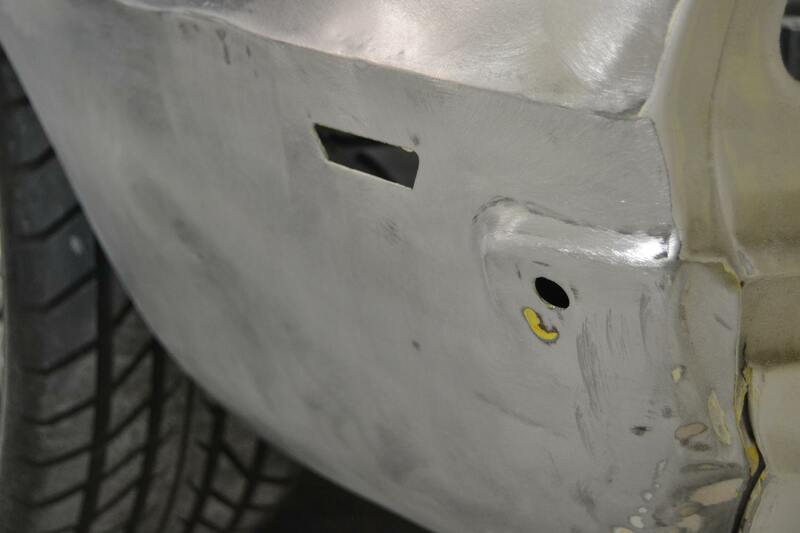 After a little metal finishing, the correct contours have been returned to the quarter panel.